Over-watering cotton wastes a valuable and scarce resource; it can also lead to rank growth, nutrient leaching, and contaminated groundwater. Since under-watering can decrease yields, the question becomes one of finding the optimum application regime. An irrigation experiment was set up to apply water at six different application rates, ranging from 33% to 144% of normal, with hopes of identifying the regime that produces maximum yield. Two cultivars, Acala Maxxa and Acala PhytoGen-72 (Gossypium hirsutum L.), were planted on sandy soil and irrigated daily with a highly efficient subsurface drip irrigation system for four seasons. The results showed that on the average there was no significant difference in the yield of the two cultivars and there was no significant difference in the yield for the three wettest treatments. The driest of the three wettest treatments, treatment 4, was a critical point on the water production function curve. It represented the least amount of water applied that still produced essentially maximum yield, and it had the highest water use efficiency. This critical level of water application during mid-season was found to be, on the average, 95% of Class A pan evaporation; it corresponded to a total seasonal application of 654 mm of water. Any application less than this critical level decreased yields. Reducing the water application by 5% below the critical level caused about a 4.6% reduction in yield. The critical level produced a soil moisture level that remained nearly constant throughout the season. The final plant height was closely related to the depth of water applied, with the wettest treatment producing plant heights of 2.0 m, and the driest treatment producing plant heights of 0.6 m. At the extremes of the water application rates there were some small differences in the early-season growth rate of the plants, but the main cause of differences in final plant height was the date of cutout (cessation of main stem node production). The length of season for the driest treatment was about 4 weeks shorter than for the wettest treatment on both cultivars. 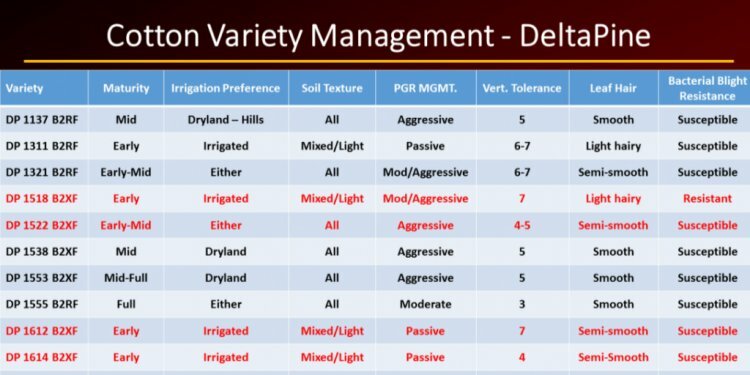 Results showed that deficit irrigation of cotton on sandy soil can greatly reduce yield, and the practice should probably be avoided.